The NIST (National Institute of Standards and Technology, part of the U.S. Dept. of Commerce) has released a container security guide (NIST SP 800-190) to provide practical recommendations for addressing container environments' specific security challenges. This document covers the major risks and countermeasures that organizations should consider deploying as best practices. 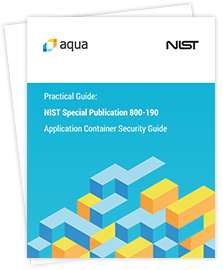 This guide provides security professionals with a checklist of the practical steps and controls they need to apply in order to comply with NIST recommendations, and describes how Aqua Container Security Platform addresses each requirement.